Wladimir Klitschko may not have fought since almost two years. But that seems to have had no effect on his physique, if his latest appearance is anything to go by. 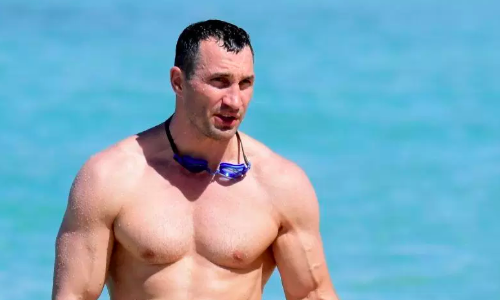 The Ukrainian boxing superstar, who announced retirement after being knocked out in the 11th round by Anthony Joshua, showed off his brawny body while enjoying a vacation with his family and friends in Barbados. Wearing just black shorts, Klitschko’s big biceps and astute abs were on display amid comeback talks. Of late, there have been chitchats about Klitschko planning to come out of retirement to lock horns with British star Dillian Whyte. Alexander Krassyuk, general director of Klitschko’s K2 Promotions, revealed there are just two possible opponents should the latter really make a comeback. “As for the return of Wladimir, I have not heard about a serious decision from his side, however, I admit there is no smoke without fire,” Krassyuk was quoted as saying by The Sun. Klitschko, 42, holds a stunning 64-5 record, of which 53 have come by KOs.